It doesn’t matter what time of year it is, or what the weather is doing outside, the Italians always venture out of an evening to ‘fare un passeggiata’ (go for a walk). I think it’s wonderful! Old men gather on street corners, discussing the weather, politics, and that beautiful young girl that just passed them by. 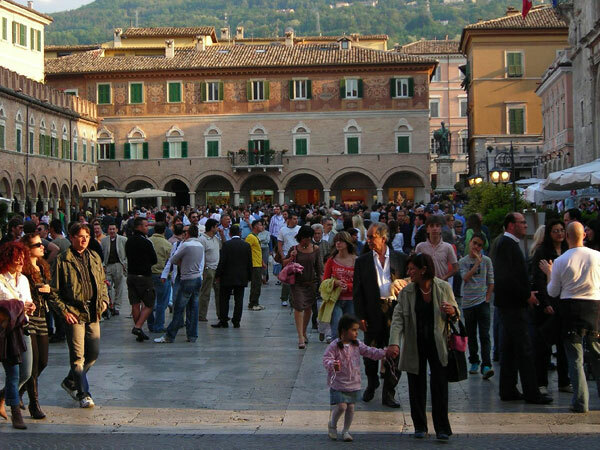 ‘Il centro’ is often buzzing with teenagers laughing and joking with their friends, and young lovers walk hand-in-hand down the ‘Corso’. The atmosphere is lively and friendly, people are happy to be amongst other people, sharing a laugh and joke and their daily news. I compare this with my country, old people at home, with just the TV for company. Teenagers hanging out on street corners, getting into trouble just to keep themselves amused. And the young lovers, where do they go? I’ll let you answer that one! Perhaps this is why the Italians live longer, the fabulous Mediterranean diet, coupled with ‘fare un passeggiata’ of an evening and sharing a laugh with your friends. La dolce vita! So, if you’re ever in Puglia and wonder why so many people are wondering around 8pm, when everything is closing and nothing seems to be going on. You’ll know you’re part of the ‘passeggiata!’. Smile, take your partner by the hand and enjoy ‘Un passeggiata’, just like a local! ← Wine by the pump! What always amazes me is that there is no rowdiness or drunkenness, they are as likely to pop into a café or bar for a coffee or ice cream as a beer or wine, it’s the chat and the exercise they go for. Exactly! In fact they are more likely to pop in for a coffee or ice-cream…. Worlds apart from England!